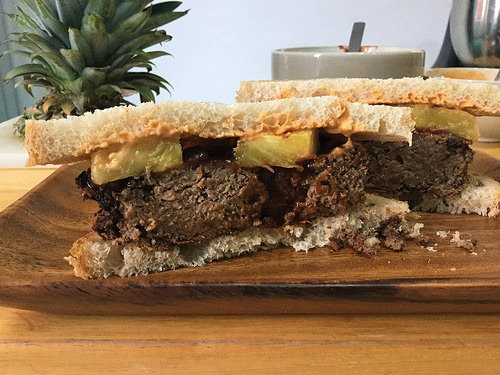 Technically, this recipe should be called BBQ-sauced tofu-pecan loaf sandwich. Now that that's out of the way, what you really need to know is that this sandwich is so much fun. Big and messy and savory and meaty and juicy, and so, so easy. The tofu-pecan loaf looks fussy, but it really isn't. Process a few things in the food processor, stir it up with the dry ingredients, and the slow cooker takes care of the rest. Which means all you have to do for dinner is whisk together two quick sauces and grill a few rings of pineapple. The BBQ sauce, by the way, is a total shortcut sauce from the pantry. It gains a little depth from being added to the slow cooker toward the end of cooking. The pineapple adds a welcome dose of fresh sweetness to the whole thing. Did I mention easy and fun? Boil the cup of water in a small sauce pan, remove from heat, and stir in TVP. Let sit 10 minutes. Meanwhile, roughly crumble tofu into the bowl of a food processor. Add pecans, sun-dried tomatoes, tamari, and liquid smoke. Process thoroughly. In a large mixing bowl, combine oat bran, nutritional yeast, garlic powder, basil, oregano, marjoram, and salt. Stir to combine, add tofu-pecan mixture, and use your hands to thoroughly combine. Add rehydrated TVP and mix again until incorporated. Press mixture firmly into a lightly oiled slow cooker and cook on low for 6-7 hours. Half an hour before serving, whisk together all BBQ sauce ingredients. Spread over top of the tofu-pecan loaf, replace lid, and let cook 30 minutes, undisturbed. When the loaf is ready, sandwich and serve. Note on tofu: Twin Oaks brand is significantly denser than other brands of tofu. If it's not available to you, purchase two blocks of the firmest tofu you can, press them for 30 minutes, then weigh out a pound.